Boo-ya! Free stock photography, right? The images are delivered to your web page via an “embedded viewer,” an iframe that includes the Getty Images logo, plus the name of the photographer. Clicking on the image takes you to the image’s page on Getty’s website. Their goal is to generate revenue through the exposure of their images (leading potentially to the paid licensing of more images) or through advertising shown in the image banner. The catch? Well, there are a few. 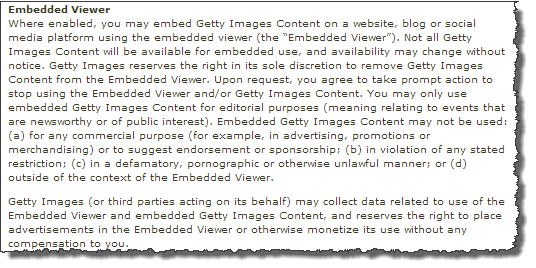 Getty Images reserves the right in its sole discretion to remove Getty Images Content from the Embedded Viewer. Link rot. That image could disappear if Getty decides to discontinue their embedded program or they pull the image you are using from embedded sharing. Tacky ads in your content. Getty might embed ads in the viewer and then you’ll simply look like a cheapskate who couldn’t be bothered to fork over a buck or two for a stock image. Plus, you lose the ability to use your images as part of your SEO strategy. No keyword-rich filenames, description text, etc. If you want to use Getty’s free images on your non-commercial personal blog and social media, go ahead. But keep them away from your business website.